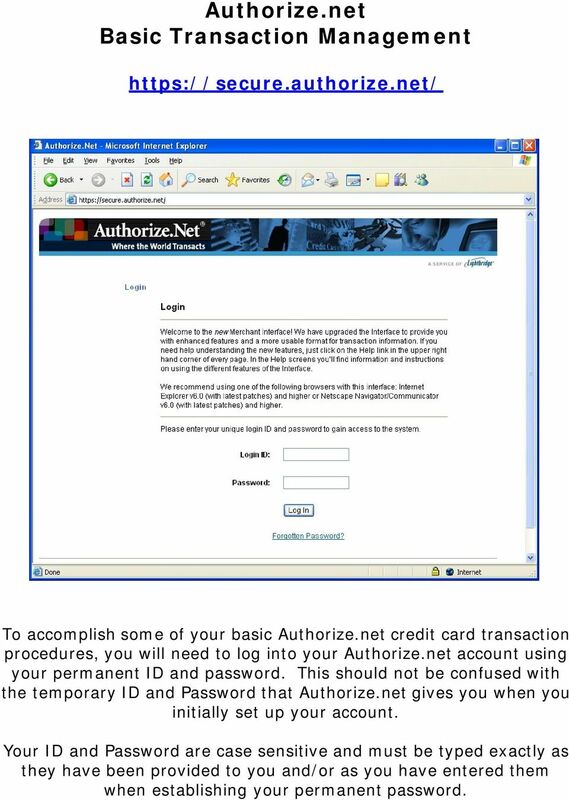 Download "Authorize.net Basic Transaction Management"
1 Authorize.net Basic Transaction Management To accomplish some of your basic Authorize.net credit card transaction procedures, you will need to log into your Authorize.net account using your permanent ID and password. This should not be confused with the temporary ID and Password that Authorize.net gives you when you initially set up your account. Your ID and Password are case sensitive and must be typed exactly as they have been provided to you and/or as you have entered them when establishing your permanent password. 2 Once you are logged into your account, you will see the below window with options along the left side. 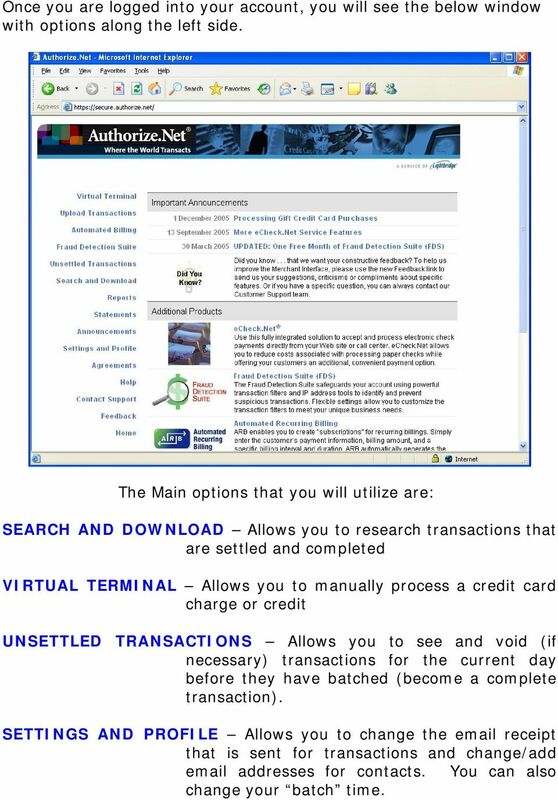 The Main options that you will utilize are: SEARCH AND DOWNLOAD Allows you to research transactions that are settled and completed VIRTUAL TERMINAL Allows you to manually process a credit card charge or credit UNSETTLED TRANSACTIONS Allows you to see and void (if necessary) transactions for the current day before they have batched (become a complete transaction). SETTINGS AND PROFILE Allows you to change the receipt that is sent for transactions and change/add addresses for contacts. You can also change your batch time. 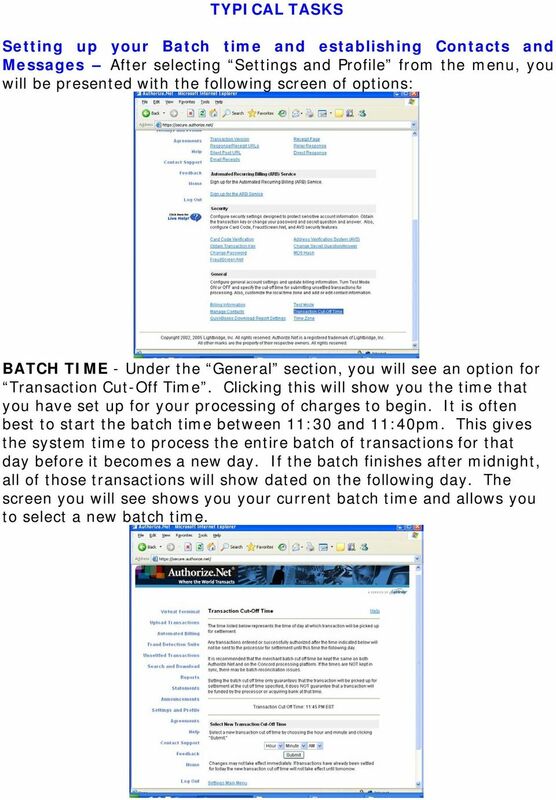 3 TYPICAL TASKS Setting up your Batch time and establishing Contacts and Messages After selecting Settings and Profile from the menu, you will be presented with the following screen of options: BATCH TIME - Under the General section, you will see an option for Transaction Cut-Off Time. Clicking this will show you the time that you have set up for your processing of charges to begin. It is often best to start the batch time between 11:30 and 11:40pm. This gives the system time to process the entire batch of transactions for that day before it becomes a new day. If the batch finishes after midnight, all of those transactions will show dated on the following day. The screen you will see shows you your current batch time and allows you to select a new batch time. 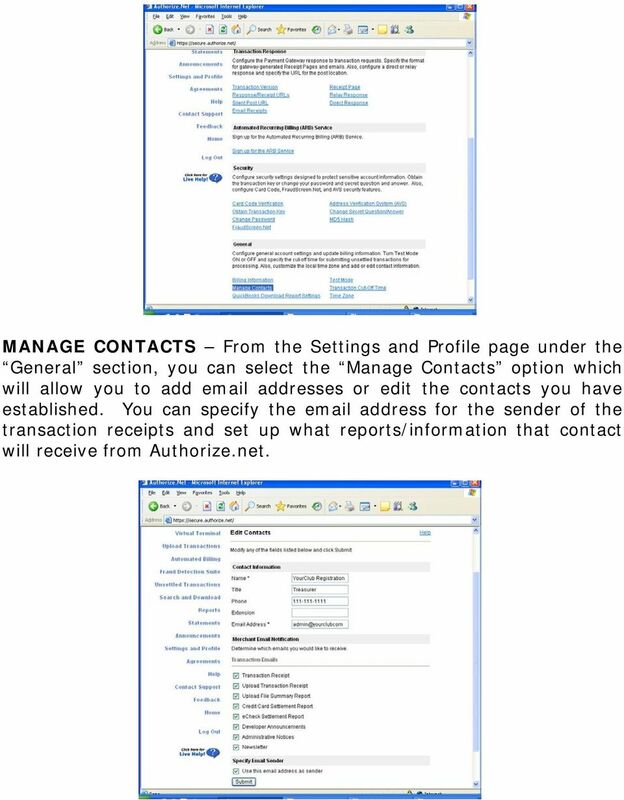 4 MANAGE CONTACTS From the Settings and Profile page under the General section, you can select the Manage Contacts option which will allow you to add addresses or edit the contacts you have established. 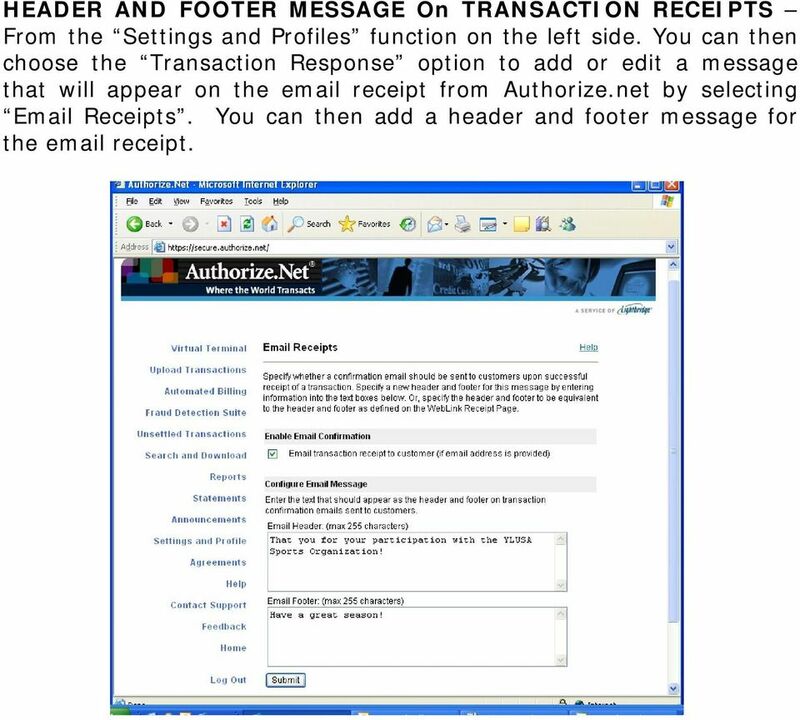 You can specify the address for the sender of the transaction receipts and set up what reports/information that contact will receive from Authorize.net. 5 HEADER AND FOOTER MESSAGE On TRANSACTION RECEIPTS From the Settings and Profiles function on the left side. You can then choose the Transaction Response option to add or edit a message that will appear on the receipt from Authorize.net by selecting Receipts. You can then add a header and footer message for the receipt. 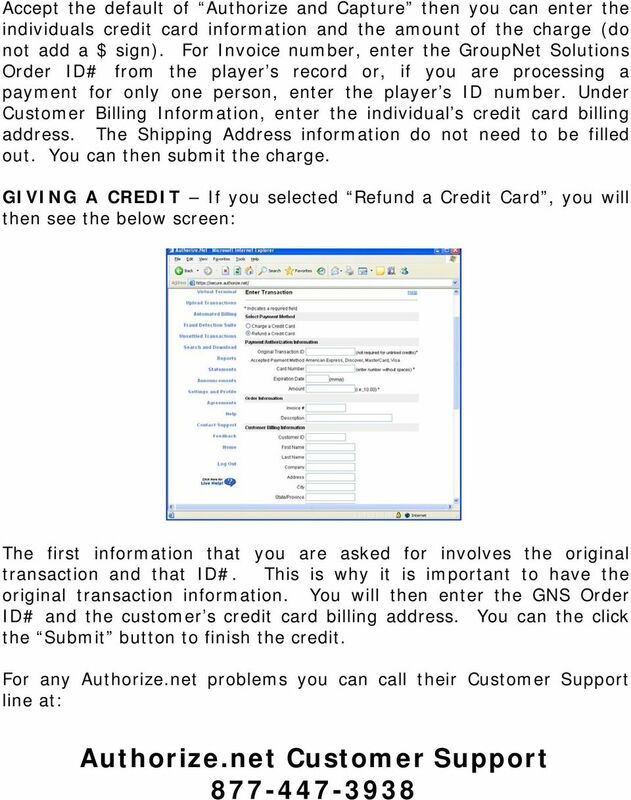 6 Researching a Transaction Once you make note in your GroupNet Solutions database of a player s Invoice number or parent name, you can then research the credit card payment transaction at Authorize.net. The Search and Download function available on the left side of the page will be one of the most used options you will utilize and is necessary, in most cases, before you process a credit. 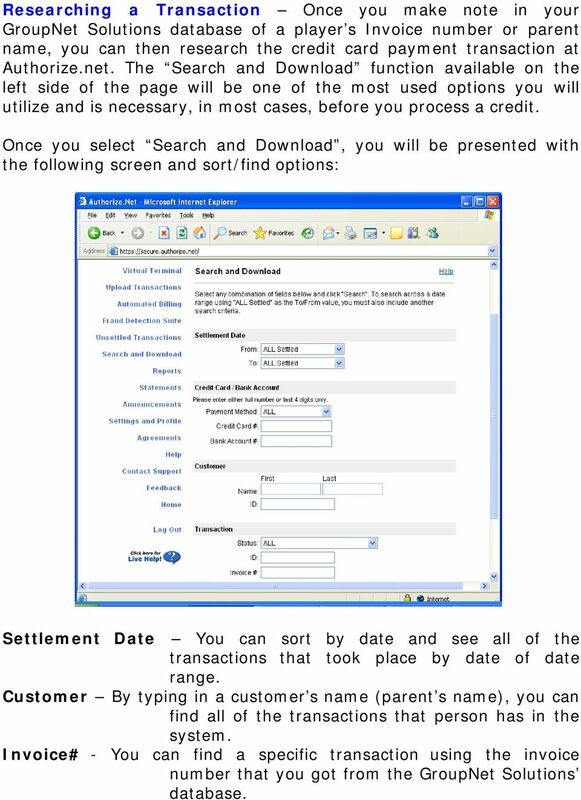 Once you select Search and Download, you will be presented with the following screen and sort/find options: Settlement Date You can sort by date and see all of the transactions that took place by date of date range. Customer By typing in a customer s name (parent s name), you can find all of the transactions that person has in the system. Invoice# - You can find a specific transaction using the invoice number that you got from the GroupNet Solutions database. 7 Once you have entered your search criteria, all of the items meeting that criteria will be displayed in summary report fashion. By clicking on the blue transaction ID number in the first column, you can bring up the detail of that transaction. About the only additional information that is included would be the parent s billing address. 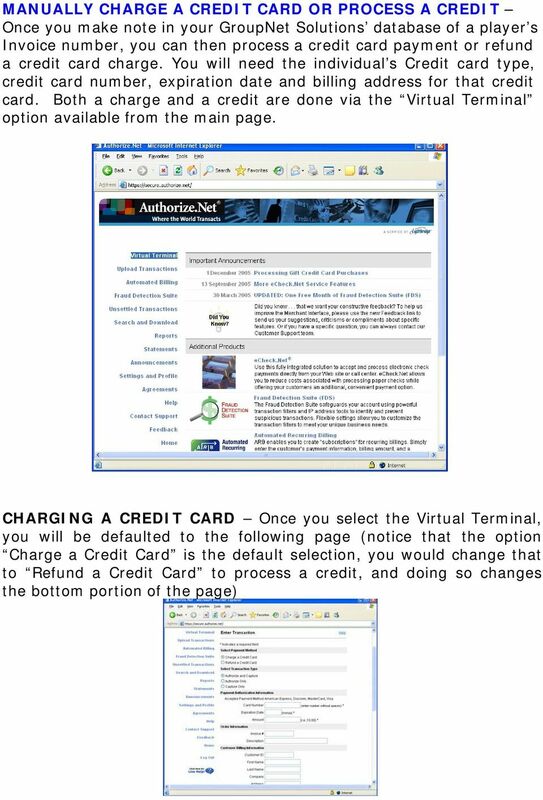 You will however need this information if you plan on issuing a credit via the Virtual Terminal. The Transaction Status will show you if a transaction was settled successfully, if there was a problem and the transaction failed or if a transaction was voided. 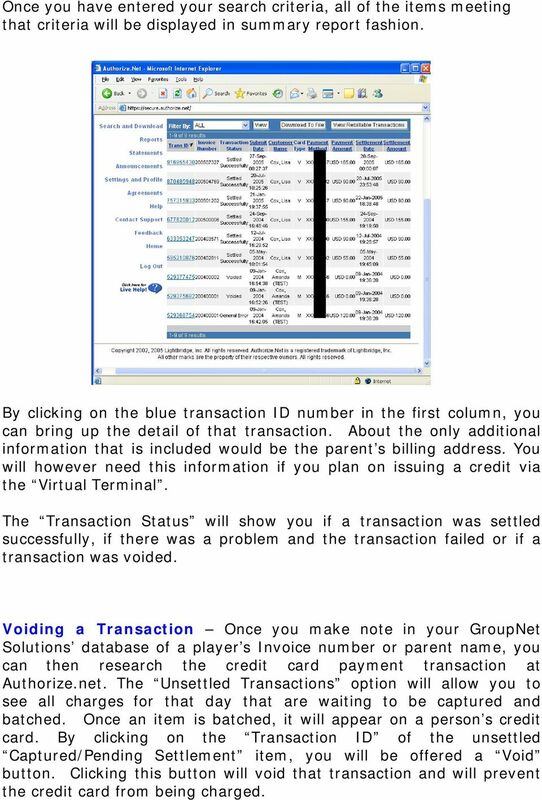 Voiding a Transaction Once you make note in your GroupNet Solutions database of a player s Invoice number or parent name, you can then research the credit card payment transaction at Authorize.net. The Unsettled Transactions option will allow you to see all charges for that day that are waiting to be captured and batched. Once an item is batched, it will appear on a person s credit card. By clicking on the Transaction ID of the unsettled Captured/Pending Settlement item, you will be offered a Void button. Clicking this button will void that transaction and will prevent the credit card from being charged. The Register Menu allows you to register, download, and activate licenses so that your players can run. SECURE 24/7 ONLINE BROKER ACCESS. Broker Access Portal. Doing Business Has Never Been Easier. The following screen shots are representative of the flow you are required to follow when logging onto www.tnt.com.au to access einvoicing. Quick Reference Guide for Online Billing Visit our website at www.executivecharge.com Click on the Customers tab on the top menu bar Logging On Click on On Line Billing first on the next page Forgot password? Great! You sold some Lexmark devices. Now you need to file for the associated rebates.